Nearly everyone in Hunterdon has cleaned their own carpets at one point. 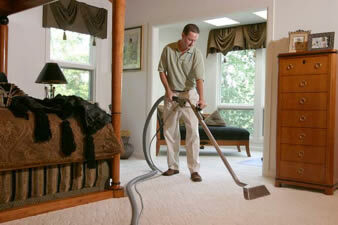 We perform this regular activity to make sure carpets and rugs present their best appearance. Vacuuming and household products work alright for awhile, but they do not attack 90 percent of the remaining dirt and grime that works its way farther into the carpet. Professional carpet cleaning is the only way to thoroughly remove dirt, debris and allergens that continually elude household vacuums and store-bought cleaning agents. Professional cleaning by reputable and expert company, High Quality Carpet Cleaning, should be performed at least every six months. Sometimes it is required even sooner, especially for high traffic households and offices, not to mention incidents involving accidental spotting and staining. Everyone with carpet, rug or furniture upholstery knows that there are many ways these things can attract dirt and stains. Children, animals and accidents are a few ways that material finds its way onto precious carpets. Mud, food, soda, wine and pet dander are just a few of the items that can attach themselves to these expensive fibers and fabrics. Regular vacuuming and wiping is not enough to remove tough dirt and stains, especially if it has been sitting there for an extended time. When carpets look dingy, the best move is to contact High Quality Carpet Cleaning so we can target the problem and solve it quickly. We have the specialized knowledge and equipment to attack dirt, spot and stains, reviving carpets, rugs and upholstery to their original condition. Do not be tempted by store-bought products that promise more than they can deliver. These products do not work effectively and often make matters worse. In fact, these products make it much more difficult for professionals to treat the problem. When customers contact High Quality Carpet Cleaning, they are confident that the dirt, spots or stains will be dealt with effectively. Not only that, but their friendly and highly knowledgeable staff helps customers protect carpets by providing answers to questions, along with helpful information on how to deal with spills or stains in the future. By far, one of the best ways to keep carpets, rugs and upholstery looking great throughout the year is to schedule routine professional maintenance by High Quality Carpet Cleaning. Carpets, rugs and furniture are expensive and no one wants to see them stained or otherwise damaged. By contacting High Quality Carpet Cleaning, customers are put in contact with experienced and knowledgeable professionals that can help preserve and protect these items indefinitely. We are glad to help protect carpets and furniture in a variety of ways that keep items in great shape, even if an accidental spill or other accident occurs. Even the best carpets and rugs are at risk of looking dingy and dirty. This is not surprising, since they are exposed to a lot of daily activity from family, pets and visitors. Ensure their good condition by visiting High Quality Carpet Cleaning and select from a range of services to keep them looking their best.